A sentence is a group of words that provides a complete meaning and sense. The above group of words provides a complete meaning. A phrase is a group of words that does not provide us a complete meaning or sense. Phrase is incomplete in meaning. The above group of words lack the meaning. Like a simple question to this phrase can be “What is there on the wall ?”. Thus it needs an answer to make it meaningful. 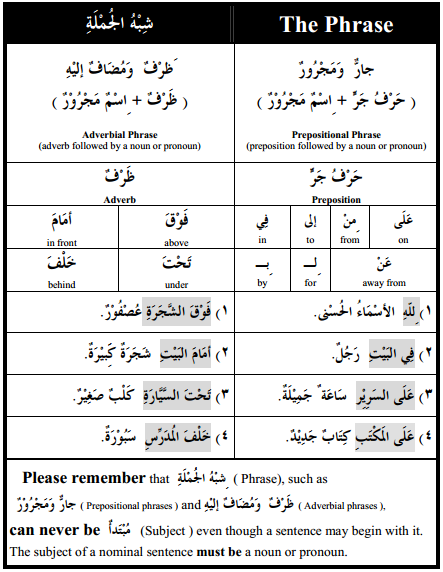 State TRUE or FALSE: فِي الْبَحْرِ (In the sea) is a complete sentence. State TRUE or FALSE: كِتَابُ مُحَمَّدٍ عَلى الجِدَارِ (Book of Hamid is on the wall) is a complete sentence. State TRUE or FALSE: ذَلكَ مِنْ آياتِ اللهِ (That is from the signs of Allah) is a complete sentence.